Synopsis: The stage is set during the 19th century London, in its capital where a wall divides the east and west of the Kingdom of Albion. Five high school girls, who enrolled in the prestigious Queens May Fair School, are involved in spy activities that involve disguise, infiltration, car chases, and more. 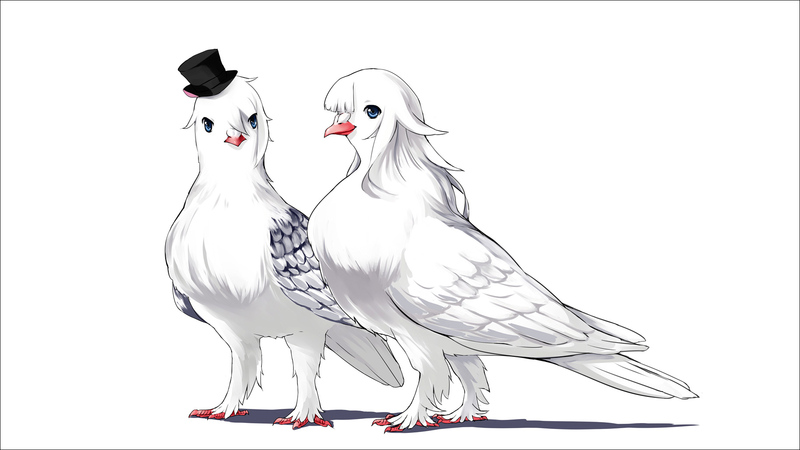 These girls take advantage of their special abilities and fly around the shadow world. ^^ Despite that very legitimate-sounding description, when I first starting watching this, I wasn’t sure what to expect. I wanted to believe this would be a serious spy anime (since there aren’t that many to begin with), but I was also wary that the all-female main cast could possibly turn into a cutesy take on the idea. Thankfully, I couldn’t have been more wrong, as this is very much a serious spy anime set in an alternate London (located in the fictional country of Albion) that seems to have been inspired somewhat by classic spy fiction, not to mention the real-world setting of the Berlin Wall. The narrative of a team of teenagers that are elite spies working to prevent global catastrophe is absolutely ridiculous, but all of the assignments the girls deal with are handled with a straight face. I myself don’t really have a problem with this scenario, but I could imagine that some people would and it being a major problem at that. If you can, however, overlook the silly aspects, the story is actually a surprisingly competent spy thriller. In addition, for the most part, the cases that the girls undertake are interesting and sometimes serve to flesh out the girls’ backstories, with an example being Dorothy’s time working undercover at the morgue and dealing with her formerly abusive drunk father, who also happens to work there. If there’s one thing that did kind of bother me about the story, it was the fact that the episodes don’t take place in chronological order. I know, it’s not a huge gripe, but I don’t think I understand the need to jump around the timeline. But at least Princess Principal doesn’t follow in the footsteps of Bee Train’s girls with guns trilogy and place an emphasis on the supernatural. That was one of my least favorite things about each of those anime, but this show is a bit more rooted in reality, even if that reality is still a little hard to believe. Moving on to the characters, there’s a lot to like here. The emphasis is clearly placed on the main cast of Ange, Beatrice, Charlotte, Chise, and Dorothy, and it’s a Merkel that they all get some degree of character development, especially Ange and Charlotte. Seriously though, Ange is the closest thing this series has to a James Bond. She’s a brilliant spy who does a great job of masking her true feelings and motivations behind a somewhat apathetic exterior that contrasts with the other girls. That’s already interesting enough, but what makes matters even better is her relationship with Charlotte. As the Princess of Albion, Charlotte seems more or less like your typical princess. Early on, Charlotte and Beatrice weren’t even part of Operation: Changeling (the objective of which is to capture the princess and replace her), but Charlotte sniffs out Ange and Dorothy’s plan and garners their assistance to aid in her desire to become queen. This all goes swell thanks to Charlotte and Ange’s history, which dates back to when they were kids. To try and put this succinctly, Charlotte and Ange inadvertently traded lives as children, with “Charlotte” going from an orphan who’d roam the streets to a princess, while “Ange” went from an inhibited princess to inheriting “Charlotte’s” former life. The names are in quotation marks because they traded names as well. They struck up such a great friendship that even after the switcheroo (and the revolution that occured on the same day), Charlotte adopted Ange’s desire to become queen and break down the figurative walls that keep people apart (and in turn, allow them to be together). Now, ten years later, they’re reunited, but Charlotte is still working towards upholding Ange’s dream to change the country. It’s a complicated situation, but at the heart of it is the friendship that these two girls forged, which changed their lives and their way of thinking. After accomplishing her goal to see Charlotte again, Ange acts as Charlotte’s would-be protector, with Charlotte being the only person able to warm her cold heart. Even now, Ange wants to run off with Charlotte and leave everything behind, but Charlotte’s still intent on seeing her (and Ange’s before her) dream through till the end. This is almost like a little romance story arc hidden among the spy narrative, but especially late in the series, it’s brought to the forefront and becomes nearly as significant as the main story. 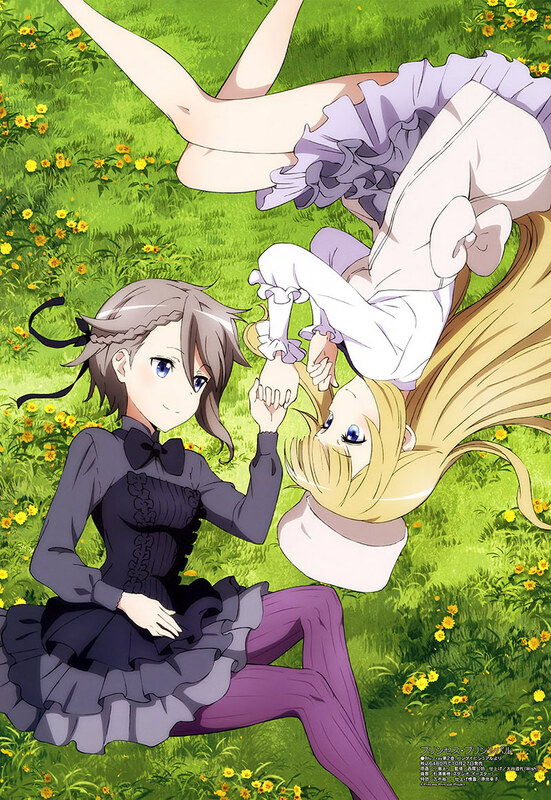 It isn’t very often that anime gives us what can be construed as a serious and fairly mature yuri relationship, so Princess Principal deserves some credit in that regard. I think most yuri fans will be drawn to those two, but the others are interesting in their own right. Dorothy is the leader of the group, not to mention the oldest of the group. As the elder stateswoman, she’s often partaking in drinking, and she’s a master of seduction. With how serious matters can be in this anime, it’s kind of nice that there’s an outspoken and more easygoing presence to lighten up the mood from time to time. She was an all-around entertaining character, and even though she wasn’t my favorite, she wasn’t my least favorite either. Chise is a Japanese spy masking as an exchange student at Queens May, and a lot of her appeal comes from her ability to fight (as well as the cultural differences that lead to a lot of misunderstandings). She encompasses the Bushido spirit to the fullest and lacks the subtlety that the other spies display. For me, it was always a welcome sight to see her striking everyone down, so I liked her quite a bit, even if she is rather one-dimensional as a character. So even though I wasn’t the biggest fan of Beatrice, overall, this was a very nice cast of characters that I ended up enjoying quite a bit. There’s some decent character development amongst them, and they all have their moments where they’re particularly charming and charismatic. As a joint production between animation studios Actas and Studio 3Hz, it doesn’t take very long to realize that a lot of care went into creating this version of 19th century London, with the backgrounds and cityscapes being particularly impressive. The steampunk-esque aesthetic is gorgeous, and there’s no lack of effort in making this city seem like it really is the stylish epicenter of an ongoing shadow war. Another thing I really enjoyed was that, despite an all-female main cast, these characters aren’t really sexualized at all and are presented in a professional manner. From time to time, Dorothy did use her womanly assets to assist with her current mission, but that’s essential to the plot, so there’s no needless fanservice that undermines the idea that these are skillful secret agents who just happen to be female. The action may not be especially boisterous and over-the-top like some other anime, yet it’s effective and provides more than enough thrills, thanks to some nice car chases, gun/sword fights, and some good old-fashioned infiltration. These are spies not assassins, so this anime isn’t a non-stop actionfest, but I think that makes the action-heavy moments feel a little more eventful and significant. All in all, this anime is a looker that nails the intended look and feel of a country in the midst of a power struggle between warring sides, so nothing but props to the studios involved. When it comes to music, Princess Principal has a soundtrack that would make even Ian Fleming proud. You could say that the music has espionage written all over it, and we have the incomparable Yuki Kajiura to thank for that. Being no stranger to girls with guns anime (she did compose the music for the Bee Train trilogy after all), she did an all-around great job here, and I don’t have anything bad to say about it. In addition to having some really good music throughout, the show also has some exceptional themes, with the OP in particular being especially noteworthy. And it may not be as memorable as the OP, but the ED is cute and is sung entirely in English by the show’s seiyuu’s, so that’s pretty cool. Overall, the production values of this anime were pretty impressive, with the sound being right up there with the visuals, so there’s nothing for me to complain about. 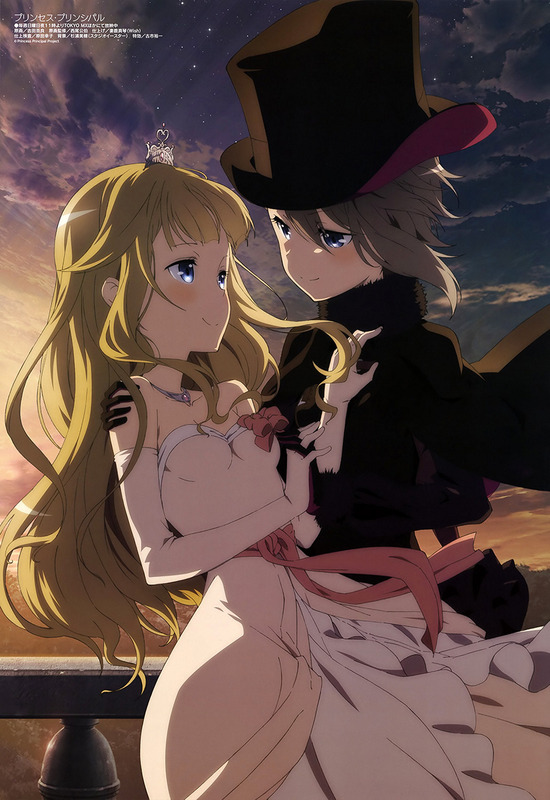 You could say that Princess Principal is a spiritual successor to Bee Train’s girls with guns trilogy, as it not only matches its predecessors in terms of intense action, but also with a thoughtful story that does for spies what Noir did for assassins, what El Cazador de la Bruja did for bounty hunters, and what Madlax did for mercenaries. This entry was posted in Anime, Anime Review and tagged Princess Principal by Rock The Vogt. Bookmark the permalink. I sincerely hope 3hz become a yuri studio. With only 2 major outings, they’re well on their way to becoming 1! PriPri surprised me too. I wasn’t sure whether it would be cute-girls-do-spy-things (which I would have been more than happy with) or dark-spy-thriller. In the end, I ended up with a balance between the 2 that leaned more closely to the dark side, with some episodes becoming even more surprising. I do hope we get a 2nd season. From what I’ve gathered, that might not be that unlikely either? It’s selling quite well and I don’t think the mobile game is a disaster, but we can only see. I’m also really hopeful of a second season. This ended up being solid entertainment which, given I went in not expecting anything, was really fantastic. I loved the characters and the story, even if there were a few cutesy moments along the way, and I just found the visuals and music really enjoyable. This one ended up being one of my only must watch shows of the last season. It was such a hidden gem! I agree about the episodes being out of order. I loved the concept and it’s a perfect fit for a spy story, but they just didn’t really do very much with it. It largely ended up feeling like a disappointment rather than something to applaud. The rest of the series was great, though, and I’m absolutely hoping for a Season 2 (with even more pronounced yuri, of course). I’ve followed this blog for awhile like since within the first year of its conception. For years, I commented frequently and gushed about action yuri. Recently, though I never expected it to happen so soon, I wanted a steampunk yuri (like Simoun but more modernly produced) and bonus points if it had action. For this anime, I got action and steampunk. Aight, cool. I really appreciate it regardless of the yuri, but then we actually got a decent yuri relationship. I friggin squealed “THIS IS ALL I’VE EVER WANTED” literally every episode. Of course, it’s not perfect, but realistically, it’s better than what I expected currently. I’m so excited for what the yuri anime world has in store for us the next several years. Cool review! Also, Happy Coming Out Day! Oh, it’s still October 11th where I’m at. Firstly, I must say thank you for the First Impressions post that included this anime, otherwise I would have skipped it. The preview blurb didn’t do this show justice. I really enjoyed this show and how wonderfully complex the relationships of the main characters are. I really didn’t mind that the episodes being out of chronological order (the case numbers help put that episode in sequence with the rest), as each episode could be stand alone episodes (well except the last few). Sort of like how Star Trek or Macgyver episodes can be watched out of order and you’d probably be okay. Another great find for the season! i agree with Shrikes, you could practically watch any of the non-ending episodes in almost any order. What always caught my attention is that when alone Charlotte could always trip up the otherwise serious Ange and make her flustered to the nth degree. Ange is such a bullet proof character that it was nice to see her non-lizard side expressed when around Charlotte. I think the only time Ange ever fumbled was thinking she could get Charlotte to run away with her. Also surprising is the rapid rate fan art and doujins have popped up around this series. Another case where Amazon hides a great show from many people. Loved that we got a fun spy story with great characters. It didn’t try to be more than that nor did it need to be. Nice review!! Huzzah! Looks like we get a season 2!